​I am currently sitting in my dining room. I took six pics. 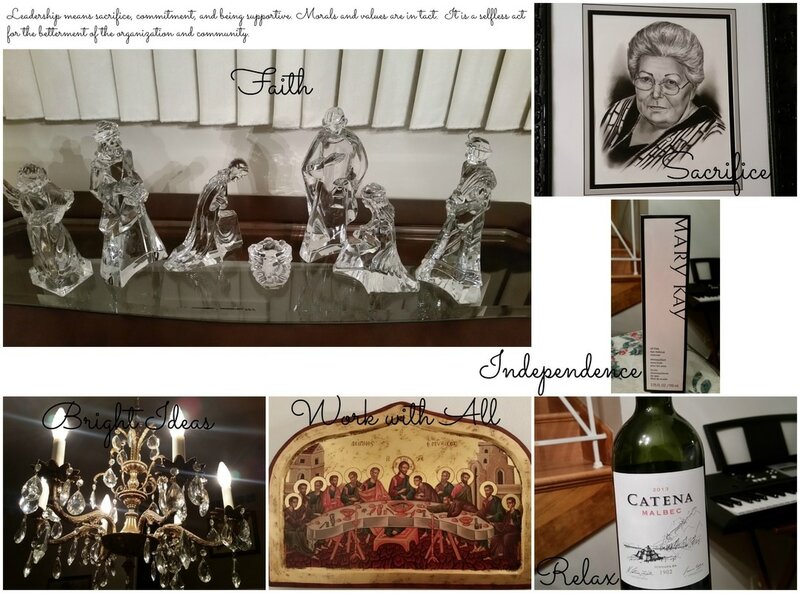 My grandmother’s portrait, chandelier, Nativity set, The Last Supper, bottle of wine, and Mary Kay Oil Free Make-Up Remover. The connections I see in the objects that I have randomly taken pictures of are that they remind me of the strength and support of my family. The space impacts me because I am surrounded by faith. My current emotional state is a bit stressed, motivated, and determined to reach my work, educational, and personal goals. Grandma’s portrait. 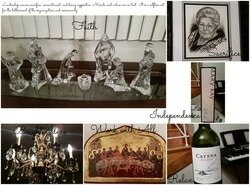 I look up to my grandmother as the leader she was in our family. She took care of all of us and gave her heart to us. I miss her. She was kind and looked for the good in people. She forgave, but never forgot. She put her family first. She made sacrifices for us. Chandelier. It was my grandmothers and brings light upon us. The chandelier with its crystals and brass finish is so beautiful. Its brightness represent the ideas leaders have. Nativity set. Jesus was a leader. Morals, values, risks. The Last Support. Followers, believers, traitors, all who you will encounter in your life. Learn how to work with them. Mary Kay Oil Free Make-up remover. I’m an independent beauty consultant, I am my own boss, I make my own schedule. I have fun with my business and enjoy playing with make-up and skincare. A leader impacts the room by their Ora, their presence, their confidence, their support, their guidance, their wisdom, their mistakes and learning from them. My emotions are impacted by leaders around me, in a positive way. The leaders around me are supportive of my ideas and encourage me to try new things. Leadership means sacrifice, commitment, and being supportive. Morals and values are in tact. It is a selfless act for the betterment of the organization and community.